Sorry this one’s a bit late. I’ll try to have Monday’s out on time, but I have a lot of Lightfest things to take care of! Stay warm, friends! 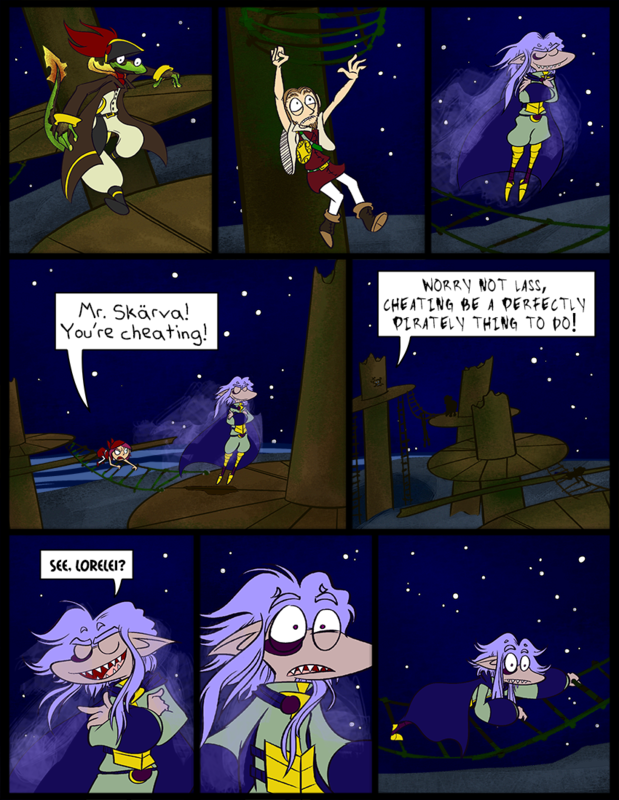 I will laugh so hard if by the middle of this adventure Skarva starts talking a little like a pirate and just gets angrier the more it happens. “HA. I AM A PIRA- wait no ****” oh Skaervy. You silly, silly shark. But traversing rigging is also a perfectly piratey thing to do. The only way to win is not to play (but then you don’t get to see the lovely treasure). … I suppose that he could deal with the problem by calling in the authorities with the arrangement being that he get the item that he’s looking for in exchange for the pirate crew and the remainder of the treasure, thus making him closer to a -privateer- — but somehow I doubt that Skärva would overmuch like deferring to the authorities either. Is your pride really worth manual labor? What little pride there is? Skaervs? I love this nickname! It is like a montage! The 6th and 7th panel would make some interesting Gravatars. Of course, many of you guys would find the ensuing rage to be cute as well. Ehehehehe, this is absolutely brilliant!